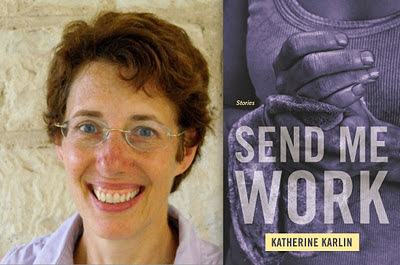 In the 30th in a series of posts on 2011 short story collections entered for The Story Prize, Katherine Karlin, author of Send Me Work (TriQuarterly Books/Northwestern University Press), lays out the background of one of the stories in her collection. One of the stories in the collection, “The Severac Sound,” has a particularly complicated genesis. I aborted my first few attempts. When the story finally flew, though, it flew; I wrote the draft in a week and later fiddled with it only minimally. My best friend Jonathan is an oboist, and I’d always been interested in writing about his trade. I traveled with his orchestra to Europe, Japan, South America, and different points in the U.S., making myself helpful by schlepping the luggage and doing the laundry. But I spent most of my time sightseeing the great cities of the world, while Jonathan rehearsed, concertized, and made reeds. Always with the reed-making. God knows how many nights I spent lying on some hotel bed or another, reading, or maybe watching Lou Grant in Finnish, while Jonathan whittled a sliver of cane bound to a metal shaper. 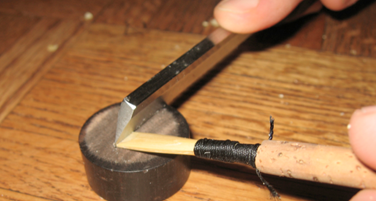 It was the reed-making that fascinated me most; there is something quaint and artisanal about it, like cobbling, and the miniature contraptions that he carries in his leather traveling-case—the knives, the whetstone, the spools of thread, and the tiny guillotine—nobly resist technological upgrades. When an oboe master who had been pivotal in his development was dying, Jonathan asked me if I wanted to travel with him to California, where he could say his last good-bye. Of course I went along, even though I didn’t know the man. I spent the day in a museum while Jonathan went to pay his respects in the morning, and a colleague of his replaced him in the afternoon. In the evening the three of us reconnoitered at our hotel. The two oboists, grown men whom I had known since we were all teens, spoke softly in the corner of the darkening room about the teacher they’d loved, and something about the scene struck me as moving and significant. But the story stalled. Two nice boys bid their teacher good-bye. So what? No matter what I tried it was sticky as cotton candy. So I went home and started writing “The Severac Sound.” That was a Monday. I finished on a Friday. And it didn’t turn out to be the story about two nice boys but a man and a woman with an undying rivalry. And it was about the extinction of the men of my father’s generation, who had been through Depression and war and bore their misfortune with self-effacing dignity. Most of the stories in Send Me Work are pulled from my own experiences in the less rarefied worlds of oil refineries, shipyards, and print shops. The orchestra milieu of “The Severac Sound” is an exception, although the workmanlike chores of the oboist are not that far removed from those of the rail worker or welder. I guess I “researched” this story, although I conducted research in the most passive way, absorbing Jonathan’s grumbles as he scraped away at his cane, one decade after the next. But what I learned most from writing “The Severac Sound” is that random vectors of ideas will strike you at your most vulnerable, and if you can tidy them up into a bundle them you might end up with a story. Joseph McElroy Asks: What Can Happen?